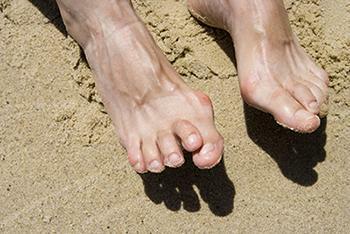 Hammertoes are deformities of the second, third, fourth, or fifth toes. The condition is often caused by an issue in foot mechanics: the person’s particular gait or the manner in which they walk, or shoes that do not comfortably fit the deformity. Hammertoes can be formed after wearing shoes that are too narrow or short for the foot or have excessively high heels. Shoes that are not properly sized will force the toes into a bent position for long periods of time, causing the muscles to shorten and toes to bend into the deformity of a hammertoe.